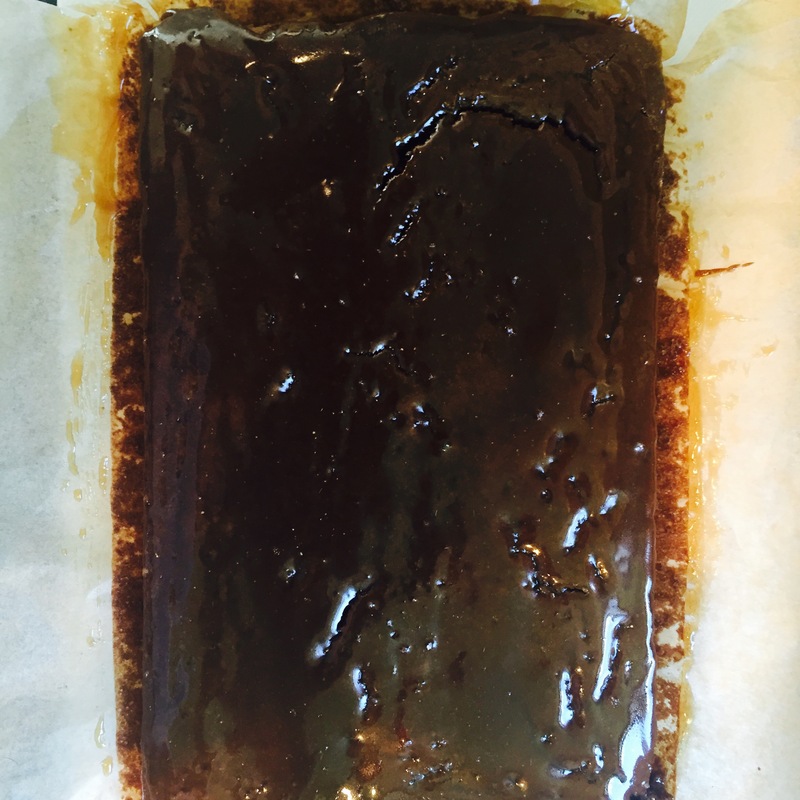 These rich sticky ginger brownies take me back to one of my favourite deserts as a wee girl. Maybe after dinner on a Saturday, I can’t remember, we’d get a warm slice of McVities Jamaica Ginger Cake swimming in Bird’s custard made thick or runny depending on who made it and how generous they were with the custard powder. The ginger bread with it’s chewy, dense texture would stick to the roof of my mouth and the warm, spicy ginger flavour would hang about until a cold glass of milk washed it down… perfect cold-weather comfort food. 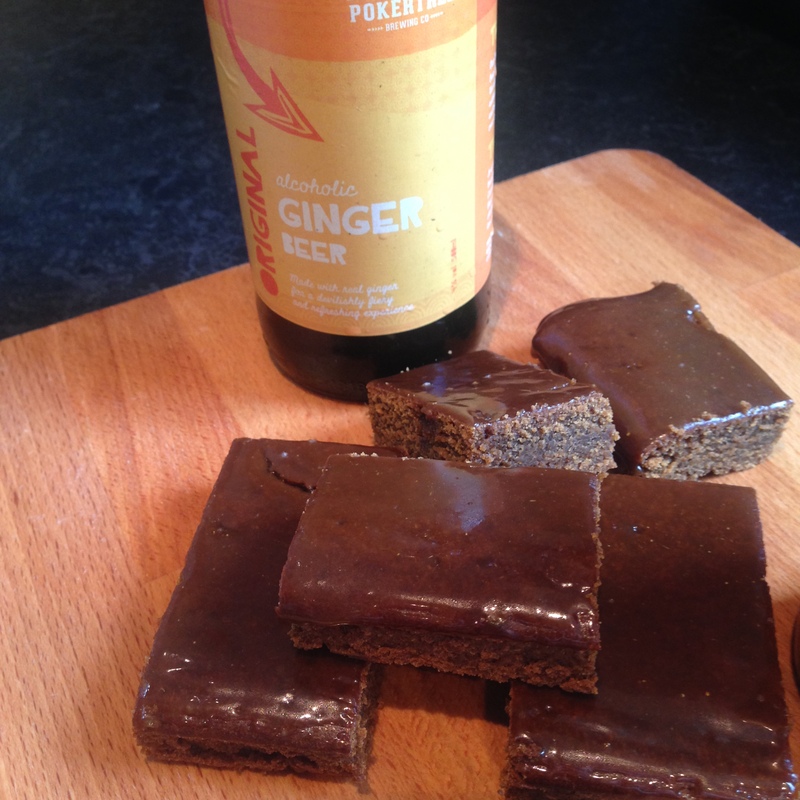 I wanted to try baking a ginger brownie with a similar texture and flavour after first trying Pokertree’s ginger beer! Pokertree’s ginger beer is full of spicy ginger flavour, and a lick of chilli, making it a great liquid base for this warm, ginger spiced brownie recipe. 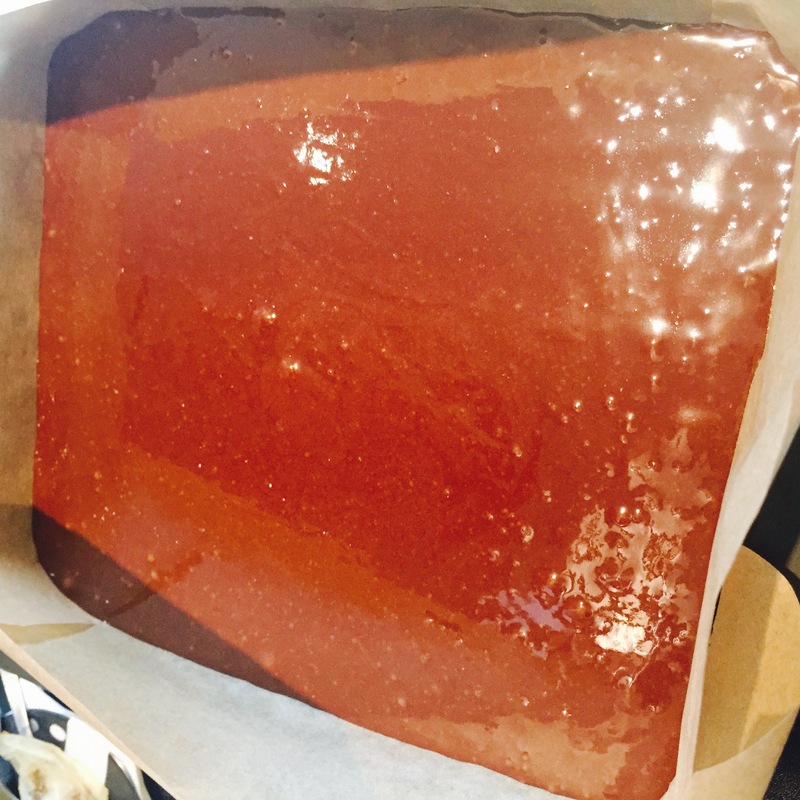 Used in the caramel glaze, it gives great colour to the brownies and the ginger & chilli heat come through in the sweet & sticky sauce. 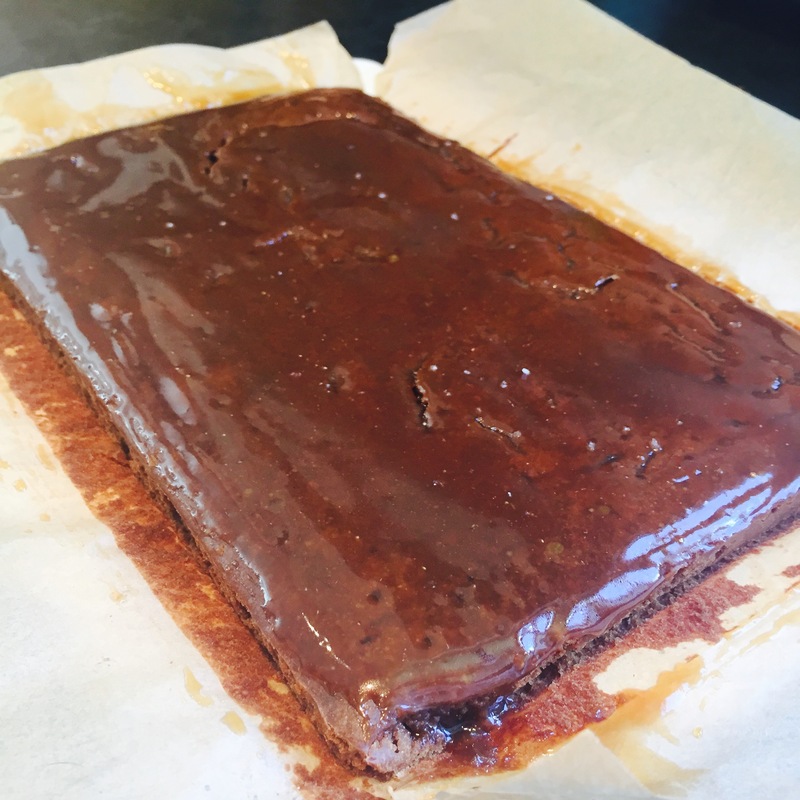 The base for this ginger brownie recipe is similar to the recipe used to make these Sticky Stout & Treacle Brownies and it was shared with me by an excellent home-baker, way out west in Strandhill, Co. Sligo, Peggy McDermott! Make sure you’ve got a few extra bottles of Pokertree ginger beer in the house, to help wash down these moreish little morsels! Calories per serving: Barely a twitch on the scale! In a pan on medium heat, warm the butter, black treacle and sugar to dissolve. Add the beer to the warmed butter, treacle and sugar and remove from the heat, stirring to mix well. Sift the flour, bicarbonate of soda and ground ginger into a mixing bowl. Add the eggs, freshly grated ginger and half of the beer, warmed butter, treacle and sugar and beat the mixture. Continue to beat the mixture until smooth, gradually adding the remainder of the liquid. Pour the mixture into a lined 7″/18cm square tin and bake in a pre-heated oven @ 150oC for 35-40 minutes. 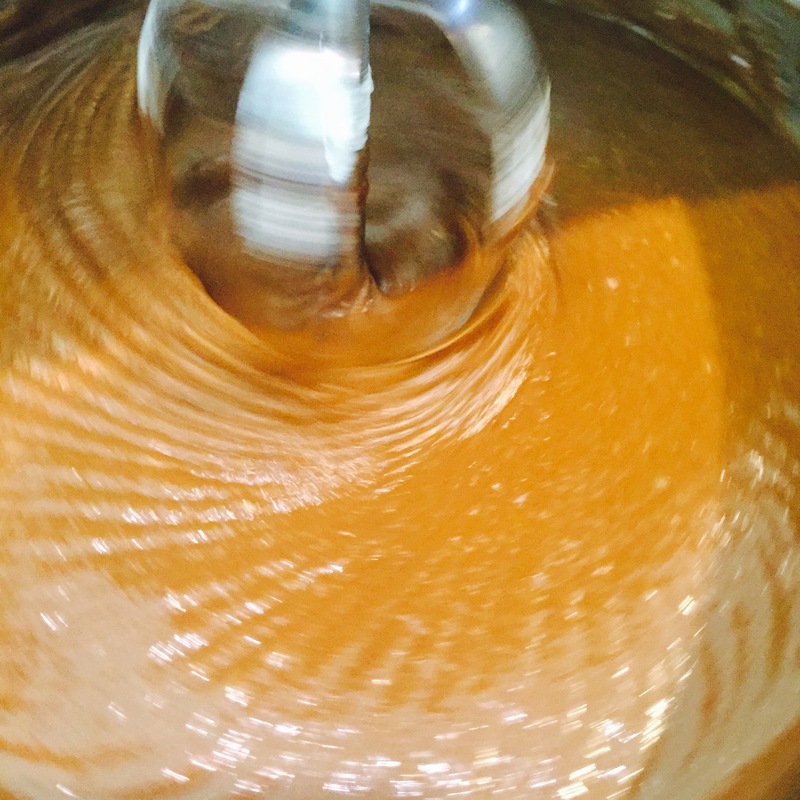 Melt the salted caramel in a pan, add the treacle and sugar and heat to dissolve the sugar. Add the beer to the pan and hold at a medium heat, simmering to reduce to a sticky glaze. Spread the glaze over the brownies and sprinkle with salt flakes. Serve warm with a large glass of Pokertree Ginger Beer. 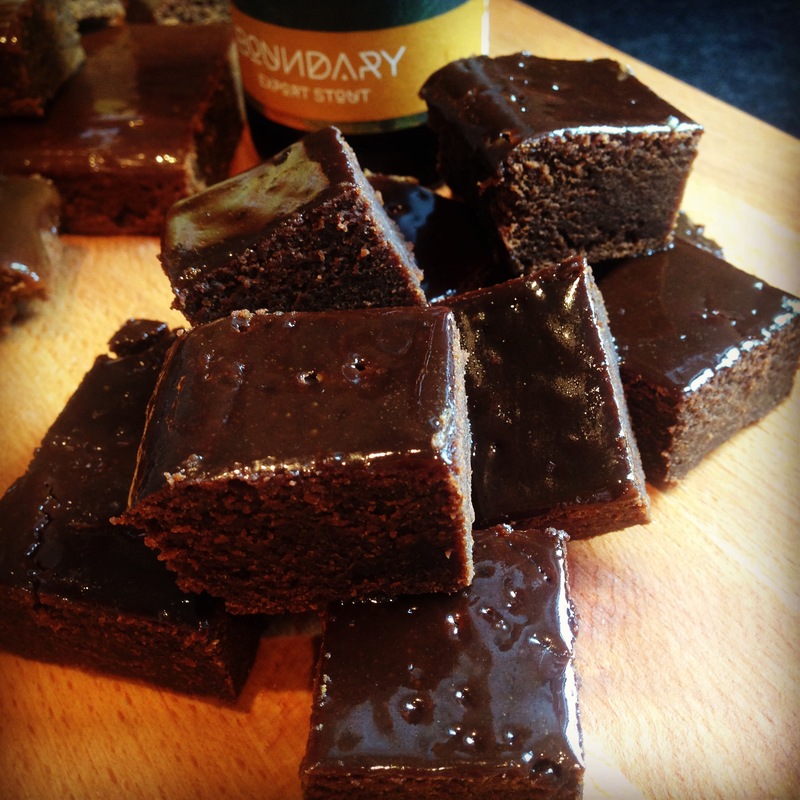 Share your ginger beer brownie recipes with us on Twitter, Instagram & Facebook. Sticky, dense little moreish morsels, these Stout & Treacle brownies disappear in record time – you’d be safer doubling the batch below! The recipe was shared with this maid by a lovely baker, way out west in Strandhill, Co. Sligo, Peggy McDermott! Peggy is a legendary lady who’s warm, welcoming kitchen often invites you in with the smell of freshly baked bread, spiced apple tart or slow roasted lamb stew and the promise of bottomless cups of tea. The recipe has been tweaked slightly to use beer in place of milk to add a richer flavour to the brownie mix. We’ve used Boundary Brewing Stout for it’s complex flavours of coffee, liquorice, bitter dark chocolate and it makes an excellent sticky glaze with En Place’s Salted Caramel Sauce. Make sure you’ve got a few extra bottles of stout in the house, to help wash down these moreish little morsels! Calories per serving: Barely a notch in the belt! Sift the flour, bicarbonate of soda and cocoa into a mixing bowl. Add the eggs, and half of the beer, warmed butter, treacle and sugar and beat the mixture. Spread the glaze over the brownies and sprinkle with salt flakes. Serve warm with a large glass of Boundary Brewing Stout. Share your stout brownie recipes with us on Twitter, Instagram & Facebook. Served up over cured salmon, steamed green veggies or poached eggs, Hollandaise sauce, a beautifully buttery and tangy sauce, is one of our favourites in the Scullery. For a taste of the ocean, to serve up with freshly baked fish, we’re adding Abernethy Butter seasoned with finely chopped Dulse and flecks of sea salt to our Hollandaise recipe – we hope you like it! 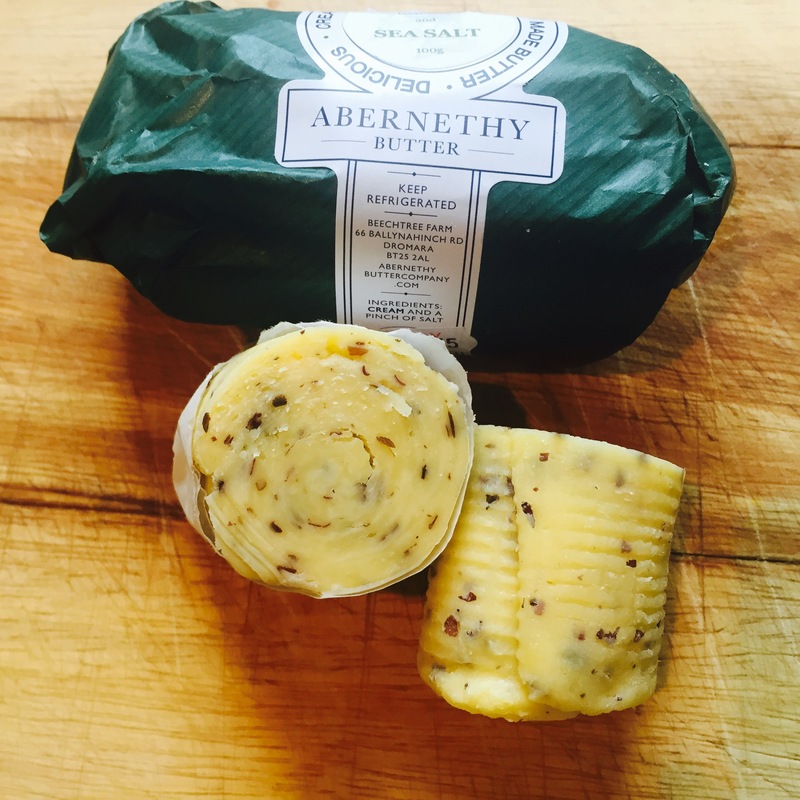 The lovely folks at Abernethy Butter, Allison and Will, launched this butter earlier in the year adding this third flavour to their award winning original butter and an award winning oak smoked butter. Not long after it launched, this creamy, smooth, hand churned butter took home a star at this year’s great taste awards. The butter works well in seafood dishes to season with a hint of savoury seaweed and sea saltiness but the Dulse seasoning also tastes great on freshly grilled steaks! If you’re serving up a hollandaise with smoked fish, we can recommend using the Smoked Abernethy Butter in place of the Dulse & Sea Salt butter for an extra hit of smokiness! If you like it hot, we’d suggest adding two teaspoons of SculleryMade Hot Sauce to the lemon juice before gradually mixing into the hollandaise! 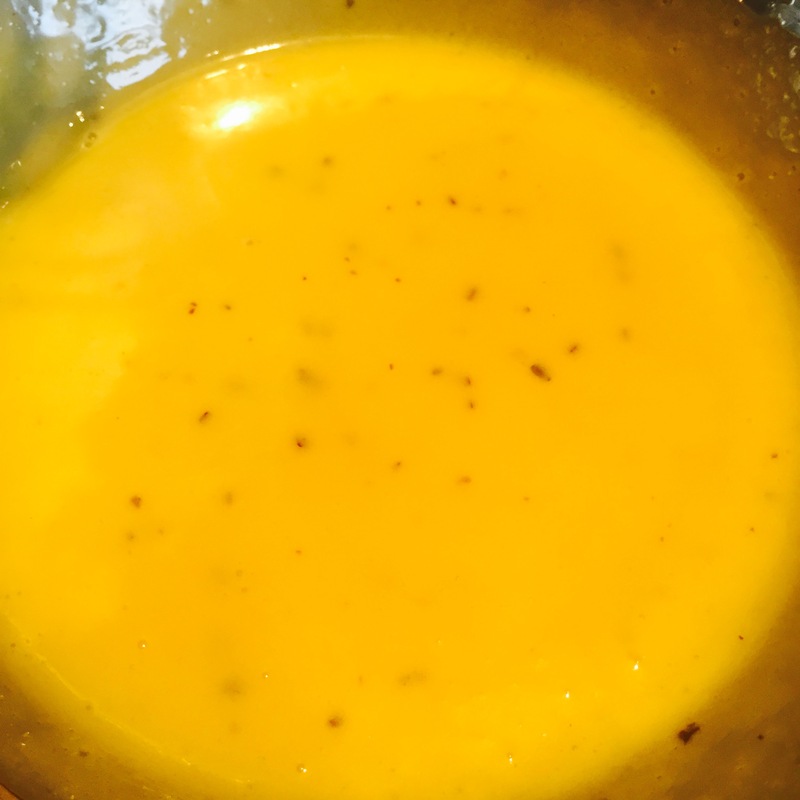 In a metal/glass bowl placed over a pot of simmering water, whisk the egg yolks and gradually add the melted butter constantly whisking over a gentle heat until the sauce thickens. Gradually add the lemon juice & rind, constantly whisking and careful not to add too much to reduce the thickness of the sauce. Share your Hollandaise recipes with us on Twitter, Instagram & Facebook. There’s a science to a light and crispy batter and the secret lies with beer. It’s complex physical properties mean that it creates a long lasting source of carbon dioxide (partly due to “foaming” proteins in the mash that help a beer keep it’s head) which makes it a great base for a light and crispy batter. As the CO2 foams in the batter while cooking, it creates an insulating barrier between the external heat and the contents inside, allowing delicate proteins like those in fish to cook gently while the batter crisps up forming a crunchy, light shell. 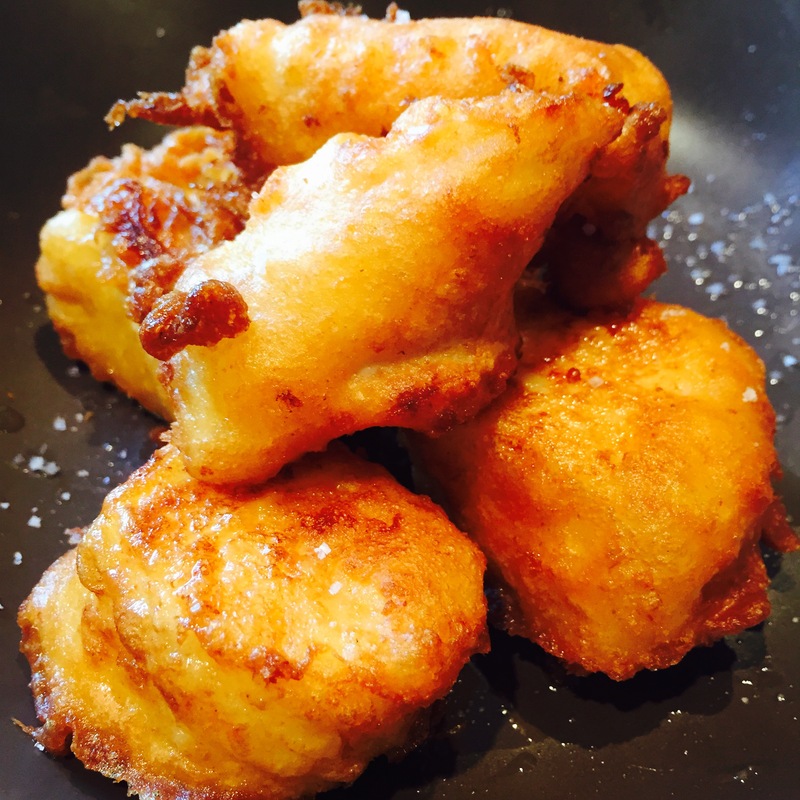 If you’re keen on more detail, have a read of this article “Beer Batter Is Better” published back in 2011. Otherwise, just get cookin’ to find out! When cooking with beer, it’s important to balance the bitterness of hoppy beers, because when they’re introduced to heat, the hops will only increase in bitterness. It’s easy to balance that bitterness when you’re using beer in a sauce or a gravy, but in a batter that would be tricky, so rather than use an IPA or an English style ale, opt for a beer with low-medium hop bitterness. 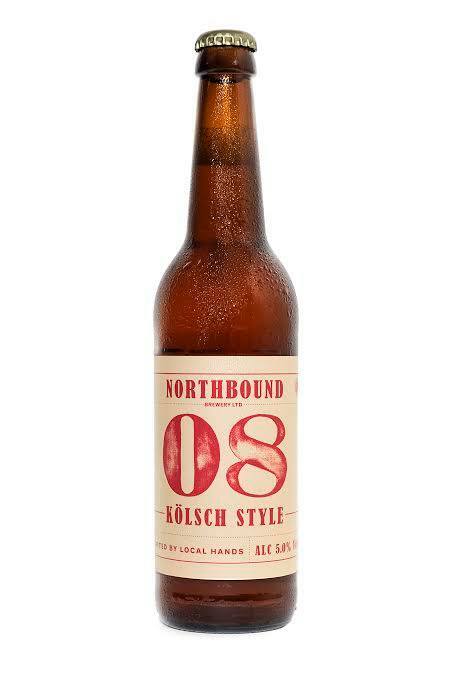 We’ve used a Kolsch-style beer brewed by Northbound brewery in Derry. The “08” has a low hop profile but keeps it’s head well making it perfect for a beer batter. This beer proudly wears a great taste 2015 award, so since the recipe doesn’t call for the whole bottle, your thirst stays deliciously quenched while you cook up a storm in the kitchen! Image from Northbound Brewery’s website. For the caper creme fraiche dressing, I used pickled nasturtium capers, picked up from my neighbour @Inns Market, Indie Fude. Jonny who runs Indie Fude does a great job curating high quality artisan goods up and down the country so it’s always interesting to see what he has along with him at the Market. The capers were pickled with dill and mustard seeds, and were delicious with the fish taco’s! Mix the grated plum tomatoes (excl. 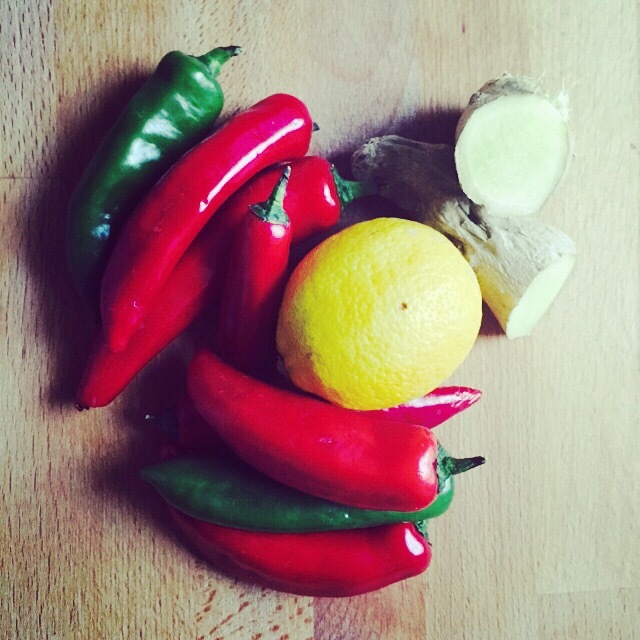 skin), garlic, ginger, chilli oil & corriander in a bowl & season with salt and pepper. Sift the flour & baking powder into a large bowl and add the salt and oil. Gradually add the water to the bowl to form a dough & knead for 5 mins. Divide the dough into 6 balls and roll each into a thin, circular shape. Cook the rolled dough on a hot dry pan until the underside starts to brown, flip and repeat. 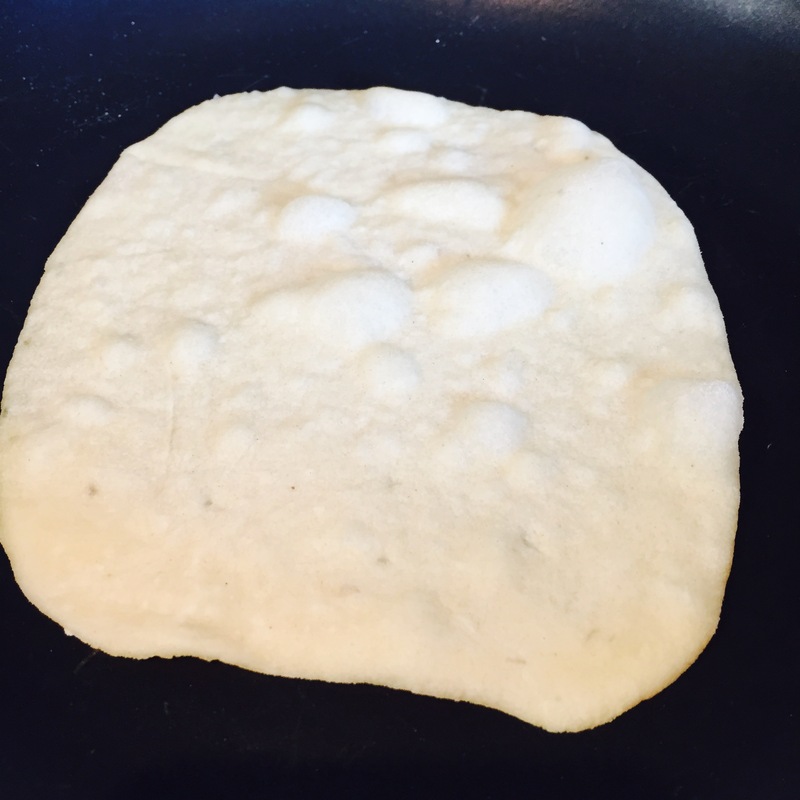 In a hot pan, shallow fry half of the taco base, while holding the soft taco at a 45 degree angle. Once half of the taco is crispy, flip to fry the other half until crispy. Finely chop the capers and mix into the creme fraiche with the sea salt, fresh dill and pickle juice. Sift the flour and baking powder into a large bowl and mix in spices & a pinch of salt. Crack the egg into a well in the flour and mix through the flour. Gradually add the beer, mixing well to break any flour lumps until you have a smooth batter. 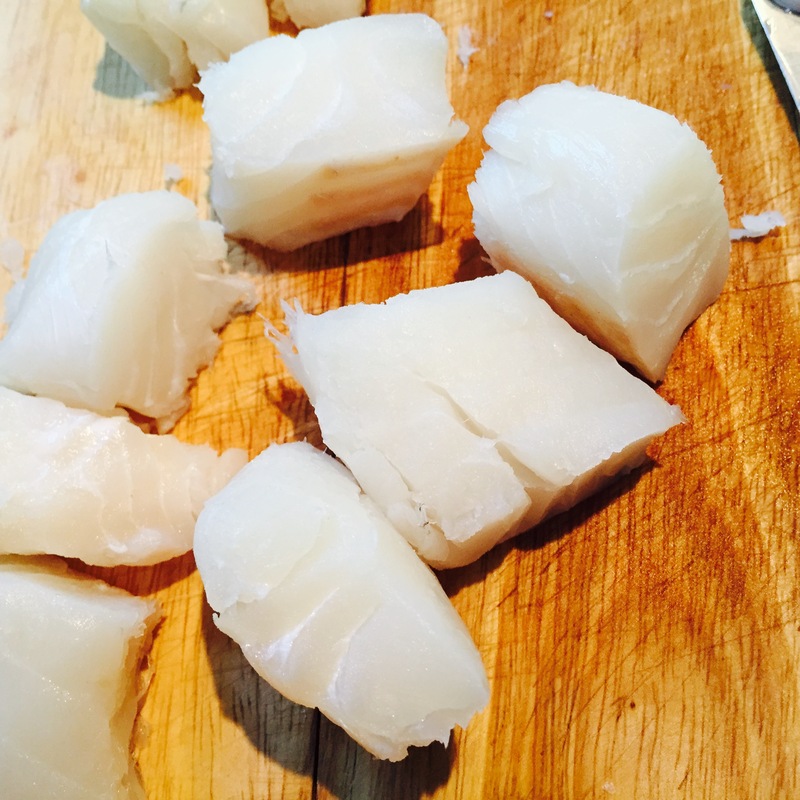 Cut the cod loin into 1.5-2 inch cubes. Dip the fish into the batter and transfer into a deep fryer on a high heat to cook until the batter turns golden and crispy. Salt the battered cod pieces immediately after cooking. Assemble the tacos however you like them and wash it all down with the rest of that delicious beer! 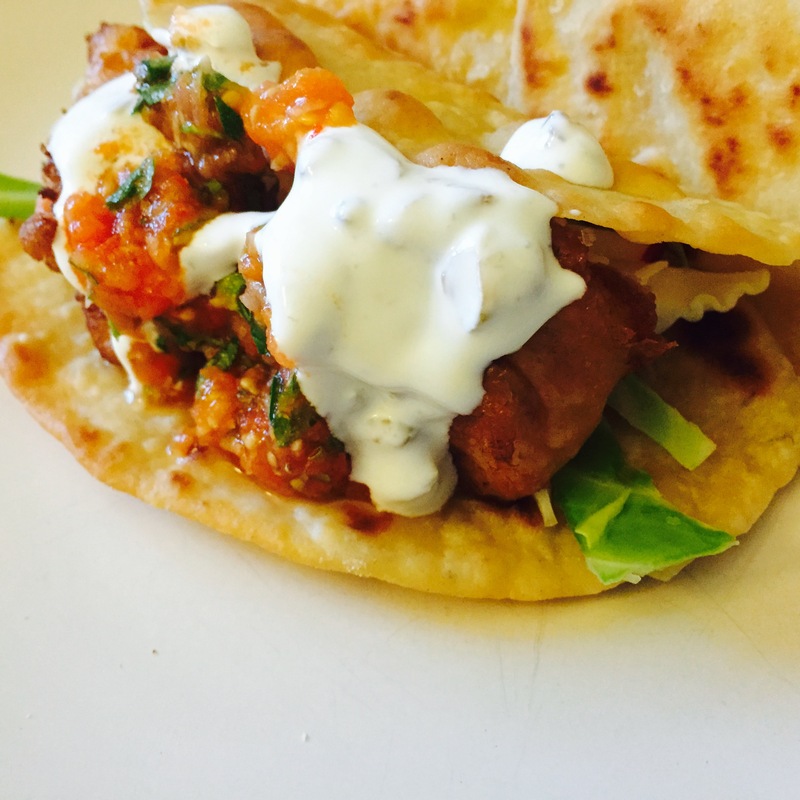 Share your Taco recipes with us on Twitter, Instagram & Facebook. Bloody Ginger Mary … She’s nothin’ but trouble! 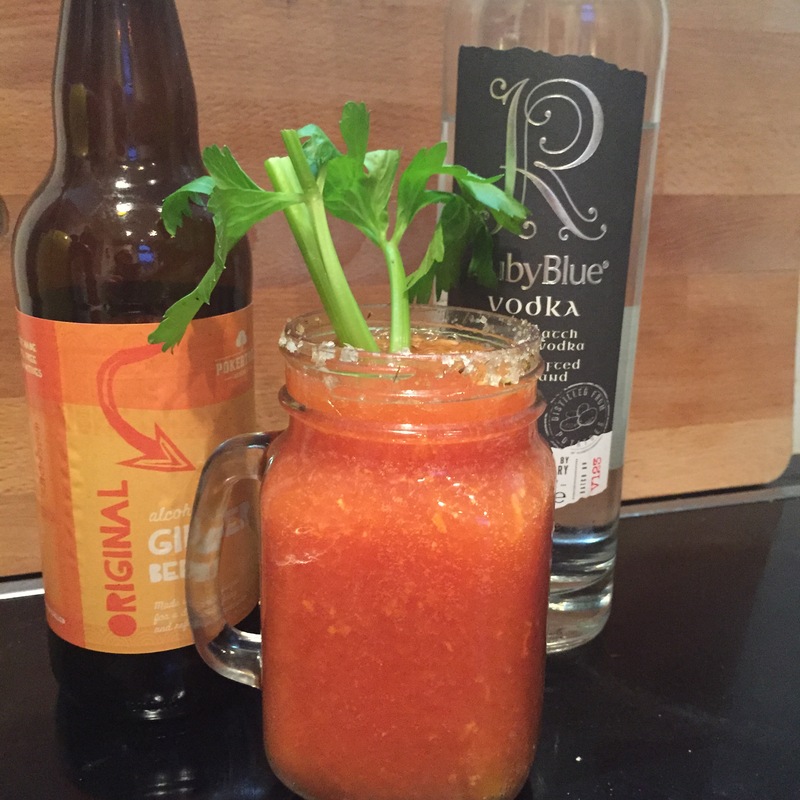 Bloody Ginger Mary …. She’s nothin’ but trouble! 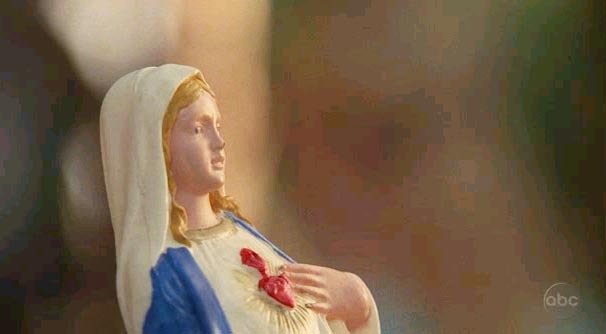 Oh Mary, you’ve done it now! I’m excited to share a wee recipe bringing together Hughes Distillery’s RubyBlue Potato Vodka and Pokertree’s feisty ginger beer. She’s your saviour in a glass, full of vitamins and spice – your classic bloody Mary with a feisty ginger twist! The vodka packs a punch at 40% ABV, 80 Proof, distilled in small batches by husband and wife team Stuart & Barbara Hughes in their craft distillery in Lisburn, Co. Antrim. It’s smooth and incognito in this recipe, but definitely not innocuous… it plays it’s part perfectly in this cocktail! The plain ole’ Bloody Mary is given a perfect ten make-over with the addition of Pokertree’s ginger beer. This beer is so refreshing, spicy and full of flavour. This Mary will settle even the worst of hangovers, promise. Cover a saucer with sea salt (Don’t worry! You won’t use all of the salt!). Wet the rim of the serving glasses with tomato juice. Dip the rim of the glasses into the sea salt to create a salty crust around the rim. Add the vodka and tomato juice to the serving glass. Mix the lemon juice, zest, grated ginger and hot sauce together and add to the glass along with the ice. Stir to mix well. Add Pokertree Ginger Beer to the glass and serve with a celery stalk. Share your cocktail recipes with us on Twitter, Instagram & Facebook. True in the 1300’s … and as true today as then! Adding a spoonful of this hot sauce will give your hollandaise a kick, make your Bloody Mary soar, turn a plain ole gravy wild and give your salsa something to sing about! … too much?! Try it and then decide! I am not a fan of super-hot heat, so by adding ginger to the mix and Burren Balsamic’s Rhubarb and Ginger balsamic vinegar adds a tangy and fiery spiciness without annihilating the tastebuds! If you are a fan of hot hot heat, add a naga viper pepper or an infinity chilli to the mix, but you’re on your own there! In the recipe, I’ve suggested straining the sauce through a sieve to remove any lumps & tomato seeds. 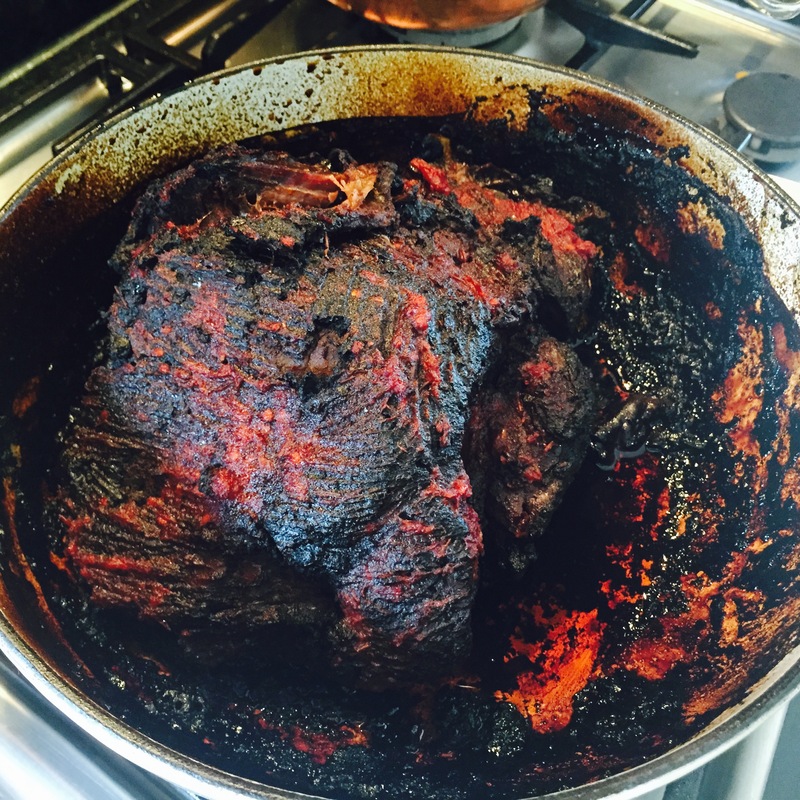 When you do this, you’re left with a rich paste of tomato, ginger and chilli seeds. Mixed with a tablespoonful of Broighter Gold chilli infused oil, this paste makes a great marinade for roasted meats. 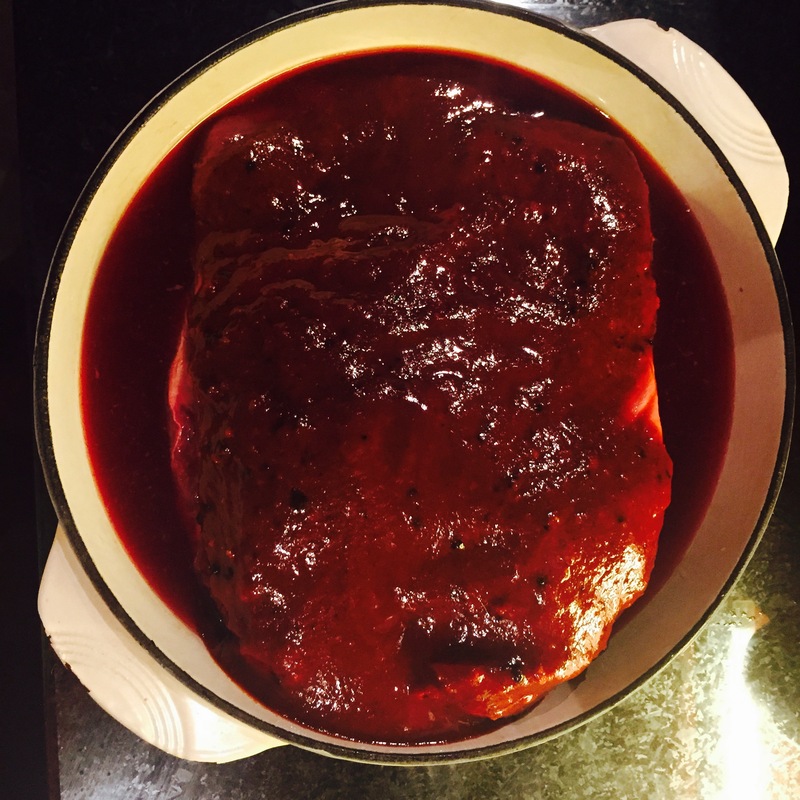 I’ve used it on Irish Moiled Beef Brisket and from the roast juices made a rich gravy using Kinnegar Brewing’s RyePA … have a go at that too with this recipe I’ve shared before, skipping the dry rub marinade suggested there. Blend all of the ingredients until the mixture is smooth. Pass the sauce through a sieve to remove any lumps. 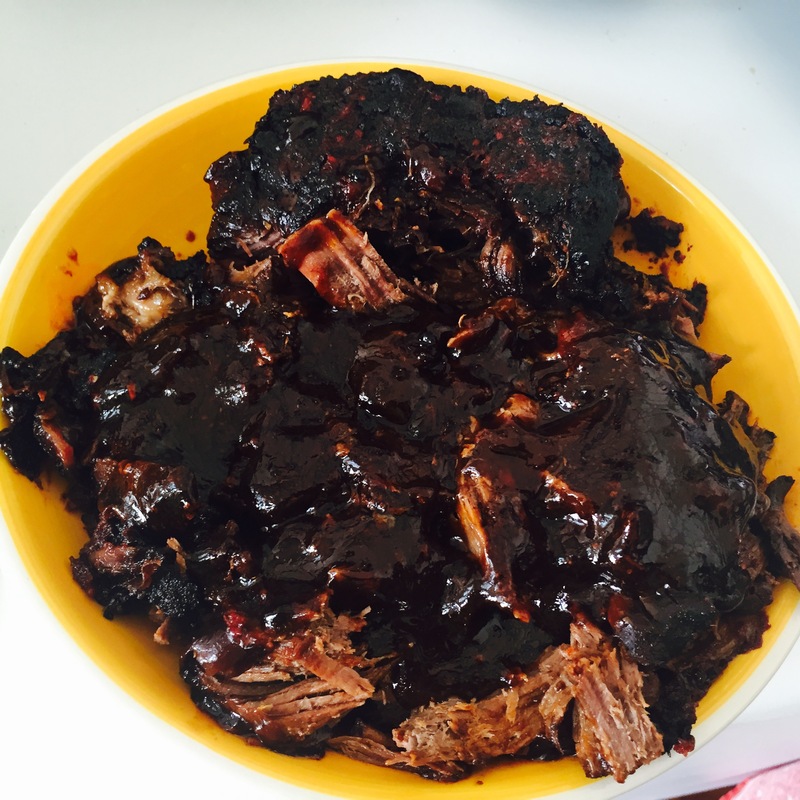 Cook on a low-medium heat for 1hr. Store refrigerated in an airtight container for 1-2 months. Share your hot sauce recipes with us on Twitter, Instagram & Facebook.